If you are asking yourself the question 'Am I fat?' then there is a good chance that you are, given that the US has the highest rate of obesity in the world. Over one third of American adults are obese and around 9 million children over the age of six are also considered to be obese and the percentages are increasing. Obesity is connected to a host of medical problems, including type-ll diabetes, hypertension, cardiovascular disease and reduced quality of life. The quickest way to answer 'Am I Fat?' is to determine your BMI. If you are an adult the table below will calculate your Basal Metabolic Index (BMI) which is a de facto way of telling whether you are fat. It doesn't directly measure fat levels in your body but uses an equation based on your height and weight to see if you fit within acceptable ranges. (Note: It will not be accurate for children or bodybuilders). Enter your figures (use the drop down arrows to change to metric), get your calculation and read on. NOTE: Recent research suggests that the currently BMI threshold for obesity (30) should actually be lowered to 24 for women and 28 for men. this is a result of studying 9,000 people and finding that although many had a BMI in the healthy range, when their body fat was measured they were found to be obese. If you are a child or teenager or the parent of one, use the calculator here. With children or teenagers with a high BMI consult with a health professional to determine if there really is a problem. If it turns out that the you are overweight, it is not all bad, and there is something that can be done about it. Something that is important to realise is that people who are overweight actually tend to live longer. Now that doesn't apply to obesity but carrying extra pounds can be an advantage if you want longevity. 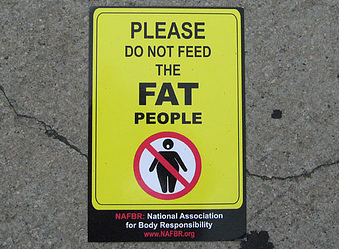 The downside is that people will treat you in a certain way if you are overweight. You may live longer but is it worth it if you have to endure years of fat jokes and an assumption that you are lazy and careless in your personal habits, even if untrue. What you should be concerned with is not the extra weight but how you look. If that extra weight is around your belly then that is not a good thing for your health. However,you can shape your body to achieve a great look and stay healthy. Once you do that, 'Am I Fat?' is not a question you will ask any longer. Visit my fat people page to find out more. If you are looking to lose weight then i recommend the Fat Loss Factor programme. Easy to do without starving and allows you to still eat some of the 'bad' foods that you like so much.